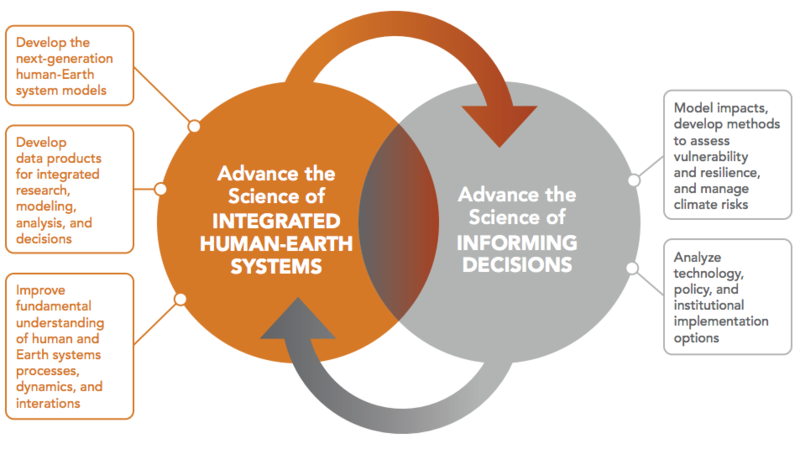 JGCRI research advances use-inspired science of coupled human-Earth systems, and to support the emerging needs for science-based information for decisions. Building on its strong science foundation established during the past three decades, the JGCRI research focuses on two major science themes and five research areas. They define where JGCRI seeks to evolve its scientific and technical expertise and enabling capabilities over the coming decade. The JGCRI research strategy emerges from an integrated perspective on the ways that people interact with each other, with technology, and with the environment. This integrated perspective, while acknowledging the critical importance of research in individual disciplinary areas, is focused on the interactions between different systems important for decision-making – for example, energy, water, land, climate, and socioeconomic systems. In addition, this integrated perspective focuses not only on the near-term or the long-term, but also on how actions today will influence interactions in the future. Finally, this integrated perspective emphasizes the value of simultaneously developing data, models and other analysis methods, conducting research, and working with decision makers to bring new scientific information to bear on their decisions.